As a new starting point for my blog, I thought I’d begin by posting a copy of a recent “meet the artist” interview I wrote for the British Polymer Clay Guild‘s monthly news letter, POLYNEWS June 2018. Do you have a trading style? 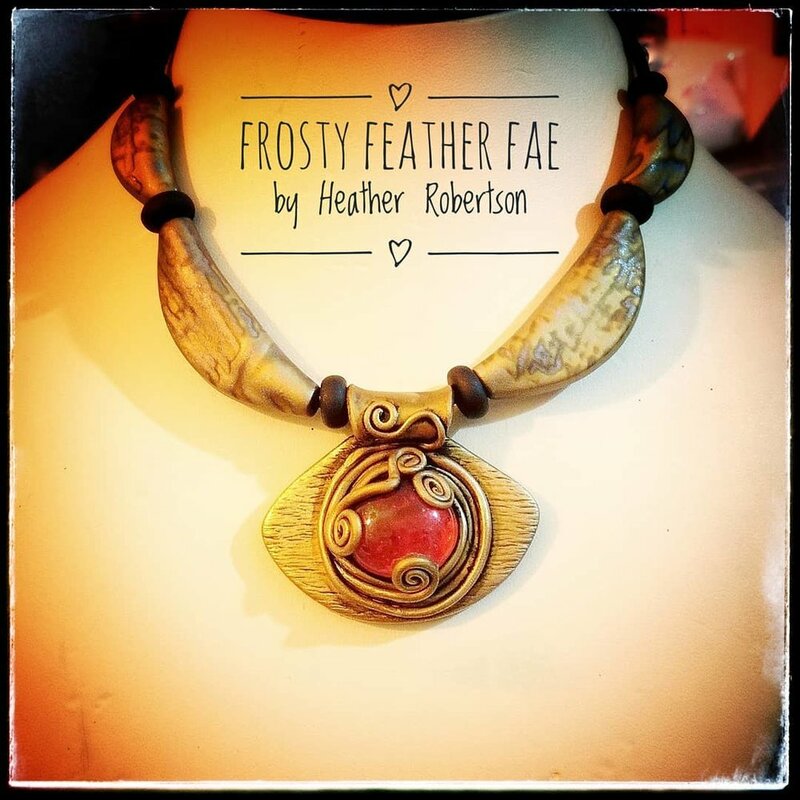 I trade under the names of Frosty Feather Fae, and Heather Robertson Art. How long have you been working with Polymer Clay? I’ve known about and played with polymer clay on and off, since I was a little girl, but never with any real success, until I picked it up again about 3 years ago, and I’m now hooked! What sort of things do you make? I started making posable fantasy dolls, boxes and Paintbrush pots – I’m a wildlife painter and illustrator and was bored of seeing my paintbrushes in old tins and glass jars. I wanted something fun and unique. I now also make book covers, dragons and fantasy creatures, and now jewellery (despite saying that I’d never make jewellery). I also create outdoor sculptures with Pal Tiya Premium, and self-hardening outdoor clay. Do you sell your work? What social media sites do you have? Yes, I do sell my work, but most of the work I sell is custom made, commissioned pieces. I have a website, which is finally going through its final updates, so I can now make changes to it myself and add my polymer work to my site, and start my blog properly. I also have a Facebook page, Instagram page and Etsy shop (my Etsy shop is currently on holiday while I create some stock). How were you introduced to Polymer Clay? I honestly can’t remember. I feel like I’ve always known about it. But I remember using it when I was about 10 (I think) to make some dolls house accessories with the help of one of Sue Heaser’s books (Making Doll’s House Miniatures with Polymer Clay), which I’d borrowed from the local library. I didn’t have much success, as the clay I had was hard and crumbly and not easy to work with (this was before they changed to the clay formula they use today, and in a very hot country, so I think the clay was part baked). The clays we use today are definitely much nicer and easier to work with. What do you use for inspiration? I guess I draw inspiration from everything around me. Nature, stories, even an old rusty tin can. My family always encouraged my love and passion for all things creative, be it woodwork, sewing, dancing, drawing, ceramics or painting, and if it weren’t for them nurturing my creativity I never would have gone to art college, and never would have explored how far I could push myself. I’m still pushing myself and learning something new every day. I grew up in South Africa, and as a family we visited many nature reserves, went on game drives, hikes, horse rides and would go camping in the mountains, by rivers or by the sea to go fishing. So I have a deep love for nature, which never fails to get my imagination going. I love it when my children and husband bring me odd stones, twigs and feathers they find. I’ve also always loved fairy tales, and find the mountains and woods to be magical places to be. I have always been inspired by the works of Brian, Wendy and Toby Froud (Labyrinth, The Dark Crystal, Lady Cottington’s pressed Fairy book), Grimms fairy tales, and more recently the Spiderwick Chronicles, and the world of Harry Potter. Anything can inspire my work. An old story, a found pebble or shell, or a lost and found button or earring. My mind never switches off, and my family all agree that I’m completely nuts and still a little girl inside, who refuses to grow up! What would you like to say / share with members of the British Polymer Clay Guild? Never grow up, never give up and keep having fun! Find out what inspires you and create the things that YOU want to make. Don’t give up when you don’t get something right the first time (or the 2nd. 3rd, 4th) I have a box full of pieces that didn’t quite work out or weren’t up to scratch. And keep having fun. Polymer clay is so versatile, and there is so much that you can do with it, so just keep playing and rediscovering its magic. Any other information you think our readers would like to know? I have recently started teaching and selling my work on a professional basis, and I’m also a certified teacher for Pal Tiya (an outdoor clay that doesn’t’ require firing).I never thought I would reach this point in my life, and it’s taking a lot of hard work. It’s the most challenging and rewarding thing that I have ever done, and I love getting to work every single morning. Keep an eye on my website and Facebook pages for more information, as I’ll be posting regular updates and upcoming workshop and event dates. I have also teamed up with Debbie Bulford and Lisa Walker for the upcoming Middle Earth Festival in Birmingham in September, where we will be running some workshops and selling some of our work. Keep an eye on our websites and Facebook pages for further updates. Thank you so much Heather, for telling us your Polymer Story.